Pool decks are the hardscape areas that surround the pools. They prevent the bare feet from stepping into mud as well as providing an epic transition from lawns to the pool. Now, they have turned into a safe haven for pleasure seekers. Here are 13 alluring pool deck ideas where you can have a ball or just hang out in. Many homeowners think that an above-ground pool will not be as attractive as its counterpart – the inground pool – because of the exposed side. Well, nothing could be further from the truth. This pool deck shows that an above-ground pool can be stunning and pack a lot of fun, too. Although the deck is not too big, it can still accommodate one or two chairs that you can use to sit back and relax. It also enables you to hang your towels on the railing and keep them dry. This is such one of the best inexpensive pool deck ideas. A partial deck is your safe bet if tight budget is the issue. It will not cover the pool completely so the flaws can be seen clearly. Read More: Most Creative Small Deck Ideas, Making Yours Like Never Before! It seems that above-ground pools are cornering the market. Many people begin investing in an above-ground pool as it will not cost them a fortune. Besides, a breadth of pool deck ideas is available to accentuate the pool and make you feel more relaxed when cooling off, just like this stylish pool deck. 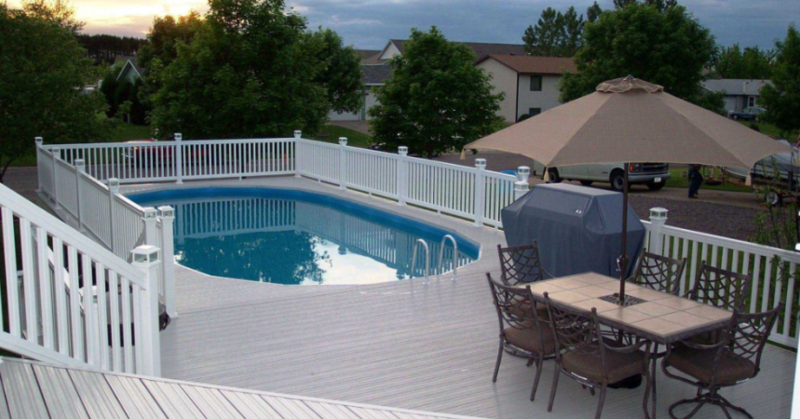 This partial deck features steps that help you to reach the pool easily. Besides, the terrace-like steps make the pool look more stylish. Don’t forget to put some chairs on the deck so that you can sit back while looking after your swimming kids. Since this is a partial deck, some of the pool side will be exposed. To cover the flaws, you can grow some dwarfs around the pool. It is super cheap and easy. A concrete pool deck is the best choice if you want to have a smooth and clean looks around your pool, not to mention the pool deck color ideas that you can get from this material. A wide array of colors is available to jazz your pool up. A concrete pool deck is suitable for mid-century modern or contemporary houses since unsophisticated lines and even surfaces are their significant characteristics. The smooth surface soothes your feet. It will not burn your feet when the temperature rises. If it is not made correctly, the surface will be slippery when wet. It is not a DIY-friendly project. You are going to need to hire a professional which means it may be costly. If you don’t want your neighbours to spy on you when swimming, install a rail around the deck will be your best bet. The railing of this deck has pretty good density. It provides the ultimate comfort and safety that you have been longing for. And now, you can swim comfortably and happily in that the inquisitive neighbours will not be able to spy on you anymore. A pool deck doesn’t have to connect the pool with your house. If the pool is quite far from your house, why don’t you build a detached pool deck? This detached pool deck is quite sizable. 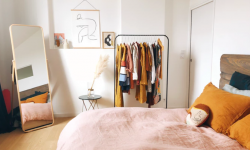 And thus, you can furnish and decorate it to suit your style well. Install a detached patio roof at the corner for a multifunctional spot including an outdoor dining room. Don’t forget to hang the blinds to protect you from the glare and heat of the sun. To perfect the deck, four lounge chairs are added by the pool. They enable you to lounge on while sun bathing or even reading your favourite romance. Many people are dying for the luxurious look of an inground pool but they can’t stand the pricey installation. Installing a raised deck that completely covers your above-ground pool can provide an inground feel without burning a hole in your pocket, just like this pool deck. Since it is quite high, you may need to install some railings around the deck to ensure the safety of your kids. Talking about kids, investing in a slide putting by the pool can make them smile exuberantly. They are going to love it. Deck skirting is also needed to anchor the deck so it will not look like as if it were floating awkwardly. You can install deck skirting using various kinds of materials, but in this deck, a lattice work is used because it gives an exquisite look and good circulation beneath the deck to alleviate moist. Don’t keep the joy for yourself! Invite your friends to come for a pool party and have a ball with them! Throwing a party on a pool entails scrumptious refreshments and a spacious deck. Make sure that the deck can accommodate all of your friends. Besides being spacious, the deck has to be super cool so you can impress your friends. A rectangular swimming pool might look mundane if it is not decorated properly. But this pool is not mundane at all. It’s fantastic! This pool is bordered by a wooden deck that provides the natural look to it. The surface has been sanded meticulously so it is smooth enough for you to step on – no need to worry about the splinters that you might encounter. Instead of placing some more lounge chairs around the pool that will eat up more space and bucks, you can use the step as a built-in bench. Just add some chair cushions along the step for a more comfortable seating. An undersized backyard cannot hinder your kids from basking in the water of the pool. You can still make them smile while maintaining the excellent look of your tiny backyard. Due to the limited space, you cannot make a spacious deck where you can lounge on a chair by the pool. But you won’t let the pool float by itself, will you? Therefore, making a small pool deck that connect the pool with the house and create harmonious flows from an area to the next is your top-notch solution. Despite being small, the deck can keep your kids’ feet clean before they jump into the water. It also provides an easy access to the pool. As an entertaining area, a pool deck needs decorating. It has to look as attractive as possible so you can enjoy spending the time there although you are not going to swim. Investing in some decorative plants will be a great idea as they are such versatile adornments for both interior and exterior. But don’t be excessive! Put a planter, along with colorful dwarfs in it, at both side of steps.The plants will welcome the guests with their hospitality well. Putting two or three patio umbrella stands is worth trying. They are not only decorative, but also functional since they can protect you from the glare and heat so you can still feel comfy hanging out in the deck at noon. Large pool decks pack a lot of fun. You can do many things in it including having a barbeque party. This white pool deck is large enough to accommodate your friends and family. The kids will enjoy swimming and playing with the water while the adults are preparing for the meal. The white railings are installed to keep your kids safe. You don’t want the height of the pool jeopardize the kids and ruin the fun, do you? Besides, the railings accentuate the deck well, making it look more elegant. Add more style to your pool by building a bridge over it. This bridge does not only give the touch of elegance to the pool, but also helps you reach the other side of the deck more easily and faster. And if you don’t feel like swimming, you can just sit on the bridge while soaking your feet in the water. It will be fun. An inground pool has never failed to be impressive. Teaming up with the charm of natural stone pool deck, this swimming pool has become more inviting so you will feel like spending your time outdoor rather than in your living room. Some woven lounge chairs are placed by the pool to add more accent to the deck. Some woven chairs also sit around a table and pool umbrella to ensure your ultimate comfort when bantering with your friends or enjoying lunch outdoor. These swimming pool deck ideas are absolutely alluring. You now have 13 ideas to choose from, but don’t be overwhelmed! Some ideas may work with your pool and yard well while some others may not. You need to consider the available space and budget before applying one of these pool deck ideas to optimize the look. Happy trying!